A building shaft is a continuous vertical space substantially enclosed on all sides that extends for two or more floors, and includes elevator shafts, ventilation shafts, stairwells and service shafts. A floor opening can also be an opening or hole in a platform, pavement or yard that measures 300mm (12 inches) or more in its smallest dimension. Give notice to the division when digging a shaft or tunnel. Identify any hazards regarding floor openings or shafts before work begin. Cover or guard openings in floors, roofs, and other work surfaces a worker could step or fall into. Guardrails must have a toeboard. Covers must be able to support 360 kilograms per square metre. Provide effective protection against falls when covers or guardrails are removed even if only part of the guardrail or toeboard is missing. Set up a warning sign or permanent label that informs others of the covered hazardous openings. Warning signs must stand out on a busy construction site. Ensure every building shaft that has a doorway or opening without a platform installed is covered by a solid barrier that extends from the bottom of the doorway or opening to a height of at least 2m. These solid barriers must be able to prevent workers and loose materials from falling down the shaft. Have work platforms that are integral parts of a slip form used in building shafts that are designed by professional engineers. These platforms must withstand any maximum foreseeable loads and be constructed, erected, and used in accordance with the professional design. If the platform is moved, it must be examined by a competent person and a written report must be kept by the employer, contractor, or owner. 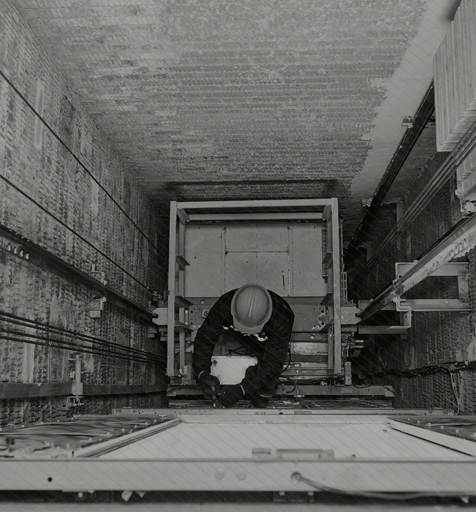 Not require or permit workers to be on platforms mentioned above without a personal fall arrest system, a full-body harness, a lanyard or a lifeline that meet legislative requirements. Set up at least one permanent warning sign on a building shaft’s barrier so that people are informed of the hazardous openings. Warning signs must stand out on a busy construction site. Fix storage tanks with permanent walkways that have guardrails when workers are regularly walking or working on top of them. If working or walking on a storage tank is required but not considered a regular part of the job, all storage tank openings must be covered or guarded where workers could fall into them. Grids are commonly used in such situations. Around each excavated shaft or tunnel opening, install a solid or wire mesh fence at least 1m high. This will prevent material from falling into a shaft or tunnel opening. Gates in the fence must be substantial and at least 1m high. Keep all gates closed when workers are not using them. Develop and implement a fall protection plan and have it accessible on all work sites where there is a risk of workers falling. Participate in identifying any hazards before any work begins and as it is ongoing; noting any openings, holes in floors or building shafts, both secured or non-secured, and communicate with others in the work area. Keep an eye out to ensure covers and other safeguards are being used. Practice proper housekeeping around the construction site. Follow safe job procedures and safe work practices. Use all forms of safeguards, safety appliances, and personal protective equipment provided. Always use another form of fall protection when installing, removing a safeguard, guardrail or cover or when working near an unprotected edge. Safeguard is a guard, shield, wire mesh, guardrail, gate, barrier, safety net, handrail or other similar equipment that is designed to protect the safety of workers, but does not include personal protective equipment. Section 120 Protection from objects falling from scaffolds, etc. 120. (1) Where a suspended scaffold, suspended powered scaffold or load-carrying unit is suspended from or attached to a structure, an employer, contractor or owner shall ensure that wire mesh, or other material equally effective to prevent objects from falling from the working surface, is installed from the working surface to a height of at least 900 millimetres on all sides except the side adjacent to the structure. (c) a hoist cage in an excavated shaft. (3) Where it is necessary to hoist or lower materials that are of such a nature that the sides of a cantilever hoist platform or skip cannot be equipped as required by subsection (1), an employer, contractor or owner shall provide another equally effective means for the protection of workers against falling materials. (4) Where it is necessary for workers to pass through a safeguard required by this section, an employer, contractor or owner shall install a gate that is equally effective to prevent objects from falling from the working surface and shall ensure that the gate is kept closed except when the gate is in use. Section 124 Openings in floors, roofs, etc. (b) provided with a guardrail and a toeboard. 127. (1) Where a worker is regularly required to walk or work on top of a storage tank, an employer, contractor or owner shall ensure that the storage tank is fitted with a permanent walkway with guardrails. (d) substantial gates that are not less than one metre high are installed in every opening in a fence provided pursuant to clause (c) and the gates are kept closed except when being used. (2) A worker who opens a gate mentioned in clause (1)(d) shall close the gate after the worker no longer has a need to keep the gate open. (3) An employer or contractor shall provide suitable equipment to keep a tunnel or excavated shaft free from any accumulation of water. 102. (1) An employer or contractor shall ensure that a personal fall arrest system and connecting linkage required by these regulations are approved and maintained. (d) is fastened to a lifeline or to a secure anchor point that has a breaking strength of at least 22.2 kilonewtons. (f) the connecting linkage is attached to a personal fall arrest system, lifeline or secure anchor point to prevent the worker from falling more than 1.2 metres. 104. Where a snap hook is used as an integral component of a personal fall arrest system, connecting linkage, full-body harness or lifeline, an employer or contractor shall ensure that the snap hook is self-locking and is approved and maintained. (d) is approved and maintained.